Energy storage is often mentioned as one of the remedies for California's duck curve problem, but the economics do not always work out. The technology is essential to a clean energy future, but it will be important to develop lower cost batteries with longer durations, according to speakers at the California ISO's recent Stakeholder Symposium. Grid scale energy storage is on the cusp of rapid growth, but "to get to long duration storage, we need to have the capital costs 10 times lower than they are for lithium ion than they are today," Yet-Ming Chiang, Kyocera professor at Massachusetts Institute of Technology said at the conference. "Over the last 60 years, we have been producing steadily more expensive battery chemistries. It is time to reverse this trend." In terms of duration, Chiang plotted out the durations and capital costs of energy storage systems. He noted that the Department of Energy has targeted a cost of $100/kWh for grid storage, but for longer duration applications, he said, that is "nowhere near low enough." The forward price estimates for vanadium redox flow batteries, which are often heralded as the answer for low cost, long duration energy storage, do not get to low enough, Chiang said. "Over the last 60 years, we have been producing steadily more expensive battery chemistries. It is time to reverse this trend. That is what I and many of my colleagues are focused on," Chiang said. More exotic chemistries, though scientifically interesting, are "probably not the answer" to the grid's need for longer duration energy storage, Chiang said. He is researching more ordinary and abundant elements such as Sulphur and sodium that would have no supply chain issues. Chiang noted that on a "cost of chemistry" the materials that go into a lithium ion battery today are between $25/kWh and $100kWh. "We really need to drive this down by a factor of 100," Chiang, who is researching "super abundant" chemistries, said. 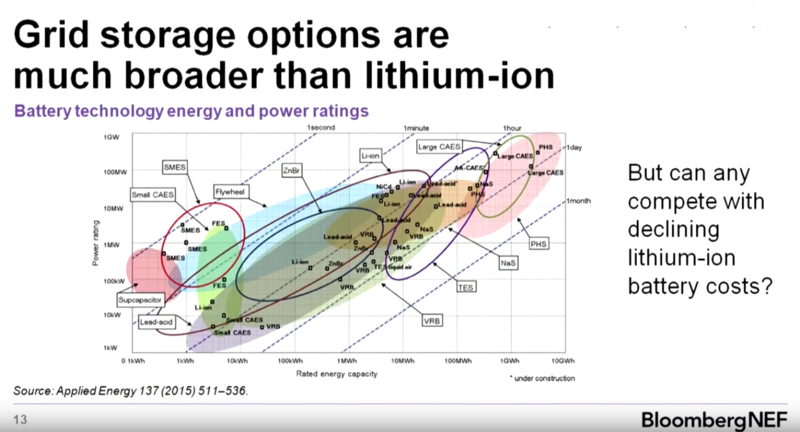 Chiang's presentation at the conference references a fuller range of battery technology. Sodium and sulphur are more widely used in batteries, but "now for grid storage it is time to come back to these" Chiang said. But those batteries probably will not look like the large boxes that often house lithium ion batteries. For grid scale storage, they are more likely to resemble a chemical factory. Those new chemistries are just around the corner. Chiang, with some of his colleagues, has started Form Energy to develop a long duration storage technology that they call "a bidirectional power plant." They hope to have a pilot project in about three years and enter into production in five years. "We are really looking at something for the next decade," he said. One of the opportunities for battery storage is to time shift peak solar output to periods of high evening demand, but that arbitrage opportunity can require wholesale prices of about $100 MWh, which are not prevalent in wholesale markets today, according to Yayoi Sekine, senior energy storage analyst at Bloomberg New Energy Finance. "It's kind of counter intuitive because you think the more solar you add to the grid, the more arbitrage opportunity there will be but as soon as you start adding more and more low cost batteries to the grid you are doing the opposite of making the case for the batteries of the future," Sekine said. Energy storage can soak up solar power during the middle of the day, which prevents solar power from getting curtailed, while batteries offset the need for ramping up polluting fossil generators in the evening. But as more batteries are added to the grid, the same thing that happens with solar power happens with batteries. "You are actually suppressing the peak power pricing because you are delivering lower cost power during those hours," Sekine said. And that diminishes the arbitrage opportunity. “If you want to integrate flexible technologies to the grid you have to think about how you're designing your market so they can provide the value for batteries so they can make an economic case." "You are depressing the very economics of the systems you're adding for energy storage," she said. However, energy arbitrage is just one of the things that energy storage can do, such as provide ancillary services to wholesale power markets, she noted. "If you want to integrate flexible technologies to the grid you have to think about how you're designing your market so they can provide the value for batteries so they can make an economic case," Sekine said.